Many big men have earned their reputation through effective use of the hook shot. 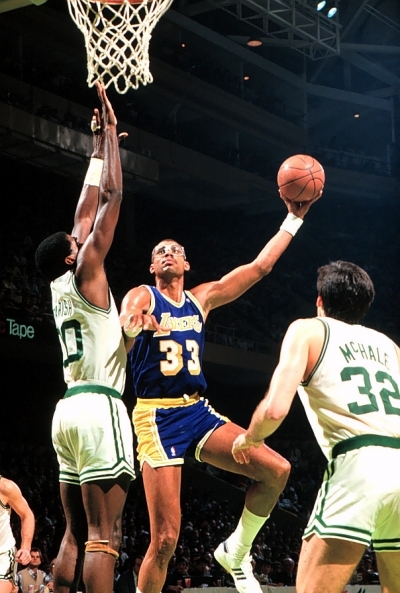 (Kareen abdul Jabbar, for example, created the concept of the sky hook.) The step away from the defender and the actual release of the ball render the hook shot virtually impossible to stop. The ability to hook with either hand gives the offensive man that much greater an advantage. In order to use hook shots effectively, a player must first develop his footwork and then his body positioning for the execution of the shot. When receiving the ball, the player should have both feet in contact with the floor. A short jump toward the ball will help make this possible. Jumping toward the ball allows either foot to be used as the pivot foot in initiating fakes with the head and shoulders and permits the receiver to go in either direction. The right-handed hook shooter makes his first step with his left foot at an angle that maintains his distance from the basket. In other words, he steps away from his defender, but not from the basket. His left toe faces in the direction of this step to allow the right side of his body to move naturally. He should turn his eyes toward the basket as he takes the first step. As his body swings around, the hook shooter raises his right knee high to allow a good follow-through. (He would raise his left knee if he were left handed.) The ball is held in both hands, with the left hand supporting the ball. As the ball is released to the right hand before shooting the hook shot, the left hand is raised to shoulder height and extended to protect the shot. The shooter’s right hand moves under and behind the ball as his right arm begins a full arc upward. The movement of his body and arm will give a natural spin to the ball. The ball should be banked off the backboard when the shooter pivots to one side or the other from the middle of the lane, and it should be shot directly at the basket when the player is turning into the middle of the lane from the side. The distance the ball will have to travel in the air will determine the angle used on the backboard. When the shot is completed, the shooter’s body should be in a follow-through position in much the same position as it would be if a set shot had been taken.